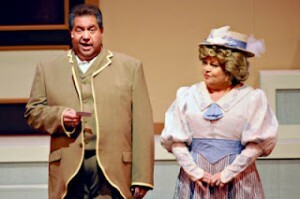 Brad Kenney and Jayme McDaniel (Ogunquit Playhouse) - Call on Dolly! America’s theatrical heritage. It has earned the title of “America’s Foremost Summer Theatre” and is one of the last of the great Summer Theatres from the Straw Hat Circuit still producing traditional live musical theatre. 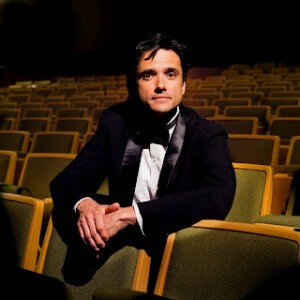 Brad Kenney is in the midst of his seventh season as the artistic director of this historic theater. This also happens to be the theater’s 80th season. 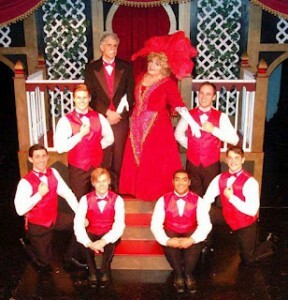 I sat down to discuss the Playhouse’s history with Hello, Dolly! with Brad Kenney and associate artistic director, Jayme McDaniel, who has his own history with Dolly! 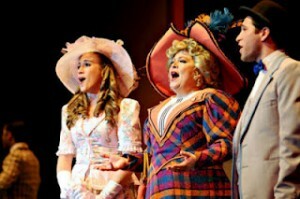 At the Playhouse, there have been three productions of Dolly! over the years. Two of those starred Anne Russell. She first of all did it for John Lane, previous owner of the Ogunquit Playhouse in 1972. He brought her back in 1985 to do it once again. 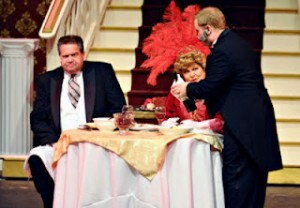 Brad brought in comedy legend Sally Struthers to do it in 2006, his first year at the theater. It was the ONE show the Playhouse wanted to do when he arrived. 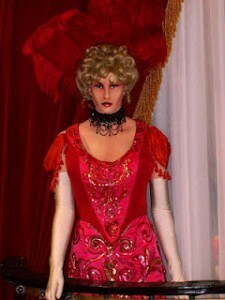 Sally had a history with the theatre having appeared there two previous seasons. When Brad arrived at the Playhouse, it was in a bit of a transition. It was once under the leadership of John Lane. John became General Manager and eventually took ownership of the Ogunquit Playhouse bringing in business partner Henry Weller to oversee the operations in 1950. Through their dedicated direction, professional integrity and impeccable taste, the Ogunquit Playhouse legacy of excellence continued through the twentieth century. John Lane retired in 1997 after transferring ownership to the not-for-profit foundation that oversees the Ogunquit Playhouse today. John Lane passed away in 2000. Sally Struthers had been introduced to the Playhouse about a year or so before that. So when Brad arrived, he was asked if he would consider doing Hello, Dolly! Starring Sally Struthers. 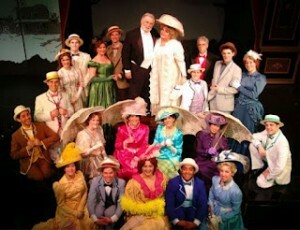 John Sheridan, formerly John Beecher when he played Barnaby Tucker in Mary Martin’s international company, directed. Previous to Brad, the Playhouse was a summer stock house…the shows were part of a stock tour. It had shared productions with other theaters. Depending upon the year, the shows would range from six to seven per season. The Playhouse would only produce two of those. Usually, it would be one musical. With Brad at the helm, the theater transitioned from a stock theater to a regional theater. The shows are now produced individually at the Playhouse. The Board of Directors wanted a season of all musicals. Since that was Brad’s background, that was fine by him. Dolly was a perfect fit with John Sheridan as director. He matched the designs that Brad had on what he desired the production to look and feel like. It would be the third production of Brad’s first year. That production had long term effects that are still reflected on their stage seven years later. Brad has great affection for Dolly and Jerry Herman’s magnificent score. It was already an early highlight for Brad at the Playhouse. He feels that the show is perfectly constructed. He considers it a valentine to musical theater. It is a wonderful story with excellent themes about empowerment and moving on on different levels for different age groups. It’s about taking charge of your life. He considers the score one of Jerry Herman’s best. With the Playhouse green lighting this production, Brad wanted to revisit Gower’s original choreography. He also wanted to acquire Oliver Smith’s gorgeous designs and Freddy Wittop’s costumes. They were really fortunate to be able to do that. They were able to even do some restoration work on some of those costumes and flats. Brad considers that production one of the benchmarks in his career and in the history of the Playhouse. What did Sally bring to the role? Brad will put it in Carol Channing’s words. 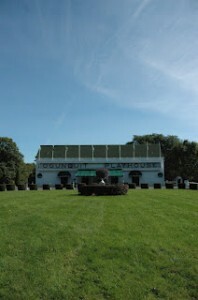 In 2007, Carol and her now late husband, Harry Kullijian, were in the vicinity of the Playhouse. She came by the theater. She had heard about the production and asked Brad who played Dolly. When he said Sally Struthers, she clapped her hands together and said, “ Oh, thank God. She’s a funny person.” Brad says it was great to hear her immediate approval and sheer joy in hearing that it had been Sally Struthers. She was glad that a comedienne was playing the road. I asked Brad if he thinks Hello, Dolly! would succeed in the twenty-first show if it was a brand new show without its history. He responds immediately, “Certainly.” The story is timeless. The music is wonderful. Brad loves Broadway revivals…especially musicals. He also loves the retelling of them when they become contemporary. He also has a bit of a reaction to my question. He is in his late forties as of this writing. He thinks the original production is really wonderful AS IS. Also, as of this writing, their production was South Pacific. He has such respect for the recent Lincoln Center revival. The Ogunquit Playhouse is the first theater to re-assemble that. This is the Bartlett Sher production that is on their stage right now. Brad says it is glorious to do that production. Again, he enjoys revivals and enjoys updating them. The King and I revival that the Dodgers did in 1996 was superb. But getting back to the original Dolly, the wardrobe design, how everything was handled in an olio fashion. Alhambra Theater CompanyAgain, it’s a valentine, a box of chocolates, or at the very least, chocolate covered peanuts un-shelled! It doesn’t need to be redesigned. Brad can’t wait to do it again with the original designs. Brad also had the opportunity in his earlier career to play Cornelius Hackl. He thinks it was in the eighties. He tells me that he sat in the Lunt-Fontaine in 1995 and had a full on emotional reaction to Put On Your Sunday Clothes. He had to pull himself together. There he sat sobbing at its brilliance. To be able to see Carol on stage and then Sunday Clothes, all of the pieces were falling in place. He doesn’t know why he is a fan of this so much. He does feel that it is one of the greatest moments from one of the greatest decades in American musical theater history. To see it in 1995 recreated so faithfully in musical Technicolor fashion. THAT’S what Brad wants to re-create yet again. Something important happened in Brad’s journey with Sally Struthers. When he was sitting in a rehearsal studio watching his third show as artistic director of the Playhouse, watching the show in its raw form with no costumes and/or props, just the actors in their theater barn colony, in the rehearsal space at the Ogunquit theater campus, he sat in awe of Sally Struthers who he remembered for her television work, most notably Gloria Stivic in All in The Family. He had no history with her personally. She was very polite and professional. He said that as he watched her, he saw nothing less than masterful comedic work going on. Certainly in the Harmonia Gardens in the dumplings scene as well as other scenes. Watching her, he knew why she has had such a career in television and musical theater. There is a reason why she has a couple of Emmy Awards. To be able to do Dolly with such a theater technician of that caliber who can mine this material to that degree and heartbreaking and a sincere fashion was wonderful. That is why Sally has had so much success playing this role. One of Brad’s greatest regrets is that it only ran for two weeks. When shows were part of the stock tours, prior to this, they ran one week. It was decided when Brad came onboard for the shows to run two weeks. He says it could have run forever, you just couldn’t get a ticket to it. He would love to re-create that experience. He feels that the dumpling scene was her best moment but that she also has a phenomenal vocal talent that most people don’t know about. A truly powerful voice. There are things that are in the script, but it’s great when a great actress makes it her own. A real comedic actress does not need to be told what to do. 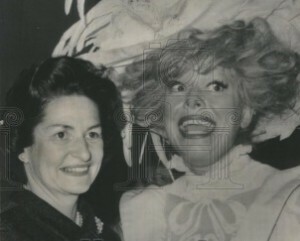 That’s why Carol Channing had such a quick positive reaction to hearing that Sally had done the role. Because of Brad’s passion for the way the original production looked and felt, it had a major impact on this production. The Playhouse had never collaborated with major producers. They wanted to find a way to not only make it easier on them but to also create the best theatrical experience for their audiences. Again, they wanted to recreate and replicate the intent and vision of the original artists that had created this masterpiece. They reached out to Oliver Smith’s widow and with her involvement, they were able to get some items from the 1995 tour and revival. Those sets were housed in New Orleans. Thankfully, they had skirted Katrina. Unfortunately, the costumes did not. They were able to take some costumes and props and refurbish them at the Playhouse. They were also helped tremendously from Costume World in Florida who acquired Eaves-Brooks and Dodger Costumes collection many years ago. They were able to get their hands on the original Freddy Wittop costumes and restore them. Brad remembers audience members being aghast at intermission at how beautiful this production was. Being able to recreate the way the scenes led into and out of the hat shop scene, for example, as it was originally choreographed to do on the Playhouse stage. Prior to Dolly, the sets were built not to push the boundaries of the theater, but to work within it. Right now, they have a restructured South Pacific. They are using Lincoln Center’s sets and costumes from the tour. They built the passerelle for Dolly and it has remained up for all other productions. Coming out of regional theater, Brad loves the thrust stage. It puts the show in the audience’s lap. The passerelle brings the shows further out into the audience. That has really changed the way they stage their productions. Brad is hoping that it will return over the next few years, perhaps in 2014 to celebrate Dolly’s 50th anniversary. He’s keeping his eyes on those sets and costumes and making sure they are preserved. At this point, Brad introduced me to Jayme McDaniel. Jayme is the associate artistic director now in his second year. Jayme has his own history with Dolly. 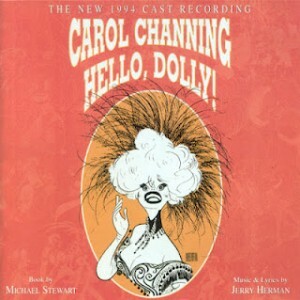 He was part of the 1996 tour after the Broadway revival with Carol Channing. On the first day of rehearsals for My Fair Lady at the MUNY in St. Louis, in which he was the dance captain, Lee Roy Reams was playing Doolittle, he was having lunch with Lee Roy. Lee Roy said, “Dolly’s going back on the road. Do you want to do it?” Jayme said, “Hello, yes!” That was it. That’s how he got the job. The first performance was outside of Detroit, not far from where it all began. Opening night was a magical experience. To be doing the title number, where the audience was on its feet cheering, was incredible. Every single time doing it was a magical experience. You felt as if you were part of theater history and the legend. Watching how Carol almost seemed to levitate and how the audience responded to her was very special. Prior to this, Jayme had done the show three separate times. He played Ambrose Kemper at Jupiter Theater with Mary Ellen Ashley. He was also the dance captain for that production and learned the Gower Champion choreography. Watching Gower’s masterwork and how he pulled people in is what first attracted Jayme. Just the fact of the “blade hand” of all the waiters, you never see hands or thumbs, they are always like blades. How they would “slice” like a cutter. Getting to do the show with Carol not only onstage but off stage, she could be so funny and throw the best parties. One of his favorite things was Carol renting out a movie theater after a show, standing behind the snack bar giving everyone whatever they wanted. She also threw a wonderful Christmas party on a boat when they were appearing in Naples, Florida. Still sitting on Jayme’s desk is a favorite picture with Carol with her arms wrapped around his neck with her Christmas outfit on. It is still one of his favorite photos of all time. A favorite memory for Jayme took place in Jackson, Mississippi. Carol was having vocal problems and during the curtain speech, she said, “ I’m having vocal problems and when that happens, I’m usually compared to Keri Te Kanawa or Beverly Sills. If there is any part of the show you did not understand, I want you to write it down and I will come back to Jackson, Mississippi and perform it for you in your home.” The audience went nuts. The entire company was laughing hysterically. The best part was one of the women in the chartreuse Sunday Clothes dress flipped her head back and laughed so wholeheartedly that her wig and hat, which were not pinned on, fell off. There she was in a wig cap laughing as much as everyone else. Carol would just speak and whatever came out of her mouth was naturally funny. Jayme says working with Carol was where he learned comic timing. Watching her say a line the same way ever performance, you learned when to drop your voice and pacing and how to use a vocal pitch to make something funny. The Ephraim soliloquy at the end of act one is Jayme’s favorite moment in the show. This, of course, leads into Before The Parade Passes By. The Mrs. Rose moment that comes through this moment is so sweet. You can take a show that is so sweet and simple and funny, bit with such a big heart. That moment is the heart of the show. Carol refers to it as the spine of Dolly. After Carol, Lee Roy had Jayme go and do it with Michele Lee in Kansas City, Memphis, and Fort Worth in 2005. Michele brought something new to it as well. She brought her own style and did not try and emulate Carol. Boy, did she sing it! She still has a set of pipes on her! She found her own comedy that worked for her. Walter Charles played Horace Vandergelder. John Scherer, who is now on Broadway in Book of Morman was Cornelius. Brian Sears was Barnaby. Susan Powell was Irene Molloy. “It was great fun. You get caught up in the music and that wonderful Michael Stewart book and you go along for the ride. “ Jayme’s favorite moment from an actor’s point of view is Dancing. To have that open stage and celebrate Gower Champion’s wonderful work with abandon. You’re just out there dancing. You’re suddenly free to dance again. Dolly has brought dancing back into Irene’s life. Jerry Herman: “So sweet, such a lovely man. 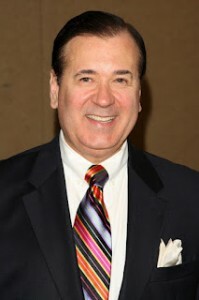 He is one of the true voices of American musical theater. He is in the likes of Sheldon and Harnick and George M. Cohan. 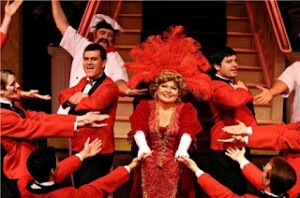 The success of the last revival of La Cage Aux Folles and the recent production of Mame at the Goodspeed Opera House proves to us that Jerry is not going anywhere anytime soon.” Obviously he had done Milk and Honey, but Hello, Dolly! was his first BIG show. Penny in My Pocket, which was Horace’s song originally closed Act One. Before the Parade Passes By brought in to replace that really set the tone and shape and future of Dolly. Because Lee Roy knows the show so well, he is great at casting. He knows the way it was intended and he sets out to honor Gower’s work. Once Marge came to see the show and she was so happy to see that Gower’s work was being honored. The first time that Jayme heard the score was from watching the movie. The first time hearing it live with an orchestra was with Carol. “When those trumpets start in Hello, Dolly!, it’s fantastic.” It’s classic old fashioned and yet you can’t help loving every single note of it. The Carol Dolly tour was created for the artists involved. They had a quick remount rehearsal period but it was done to maximize everyone’s potential. So many tours now look and feel as if there is no heart in them. Sometimes the stage manager just puts people in and no one is discussing what their intentions are or their connection with the material or each other. Because of Carol, on the Dolly tour, they ALL had their common connection of the love for what they were doing. Everyone had such deep admiration for her. Nowadays, Jayme finds most tours to be two-dimensional. They don’t seem to have a lot of life to them. Their goal is to just make money. Being on tour, they went to a lot of great places. Lee Roy sort of adopted Jayme as his “antique buddy”. So on their off days, they would rent a car and go antique shopping. The final city of this tour took place in Austin, Texas. On their opening night in Austin, Lady Bird Johnson and Ann Richards were in attendance. After the show, they were in the LBJ Library for the opening night party. Ann got up to introduce Carol. They had a great rapport together. It was if they were Martin and Lewis. It was a bitter sweet moment. Jayme thought, “We will never have a moment like this again.” There were all these dignitaries that came to see the show throughout the run. At this moment, it felt as if it was time to check out now. That last night that Carol took that last walk around the passerelle when she took the train of her dress in her hand and tosses it back with a kick, ball, change and never ever looks down. She always knew where it was. She never questioned it. It was wonderful to see her standing there with her arms outstretched and accepting the audience’s love.